We are now taking applications for studio space and workshop memberships. View our Membership Plans to see what level of membership works best for you. Classroom space is available for rental to Members and Non-Members. We now offer laser cutting and engraving services. Fill out and submit our Contact Form below for an appointment to visit SPark Workshop Brooklyn now located in the Brooklyn Army Terminal. **If for some reason your membership ends prior to a full year, it will be prorated to the month-to-month rate and the remaining balance will be refunded. Semi-Private and Private space members are required to sign a full year’s contract to be eligible for discount. *** SPark is open to Members between 5am and 1am, 7 days a week. The freight elevator is only available Monday thru Friday 9am to 11:45am and 1pm to 4:45pm. Heat, high speed Internet and electricity are included in all plans. The shared tool shop is specifically geared toward wood working. Features: a drill press, compressor, dust collector, board planer, disk and belt sander, jigsaw, table saw, radial arm saw, band saw, sliding chop saw, panel saw, as well as various hand and power tools. If you’re interested in any of our classes email classes@sparkworkshopbrooklyn.com for more information. 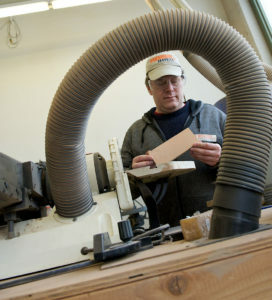 Our woodworking courses qualify participants for a 3-month shop membership once complete. *Select after hours if you can’t make a M-F appointment between 10am and 5pm and I’ll do my best to accommodate your schedule. Thursday nights and Saturday afternoons are generally when I am available for after hours. SPark Workshop Brooklyn values your privacy and our own. No information submitted to us is ever shared with outside parties.